In a telescope globular clusters are more interesting to observe than your open cluster because they have a distinctive shape. Globular clusters are odd stellar objects; they are spherical clumps of stars that actually orbit our galaxy’s core. But not the way you might think; they don’t orbit in the galactic plane, but often perpendicular to it! This is not unique to the Milky Way, most nearby galaxies have their share of globular clusters. 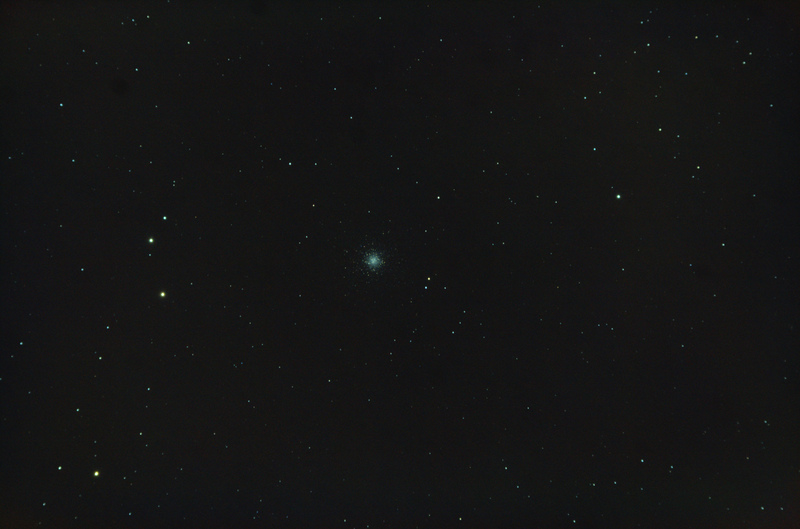 Messier 53 is a nice example of a globular cluster located in the Coma Berenices constellation. It also happens to be one of the more distant globular clusters from the Milky Way. For this one I decided to try my luck at 60sec of exposure time, and the results aren’t too bad. I did have to throw out a few shots due to periodic error causing elongation in the stars. Also during the stacking a used a sigma 2.3 value to discard anything that fell out of standard distribution to reduce the impact of the few bad images. This entry was posted in Photo and tagged Astronomy, Astrophotography, Globular Cluster, Messier by Benoit Guertin. Bookmark the permalink.